Sentiment among Japan’s large manufacturers tumbled by the most in six years, adding to signs that weakening overseas demand is hitting an already sputtering domestic economy. Sentiment dropped to 12 in March from 19 in December, according to a quarterly Tankan survey released by the Bank of Japan, an indication of dented confidence among Japan’s biggest exporters. That was worse than economists’ median estimate of 13. 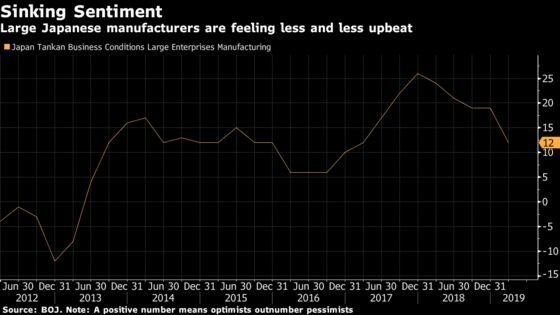 The outlook among large manufacturers fell much more than expected too, though the overall results still show Japanese companies remain generally optimistic. While sentiment among large manufacturers remains positive, it hasn’t risen since the end of 2017. That’s likely a concern for Bank of Japan policy makers seeking a cycle of higher profits feeding into growing wages and consumption, but not a shock result that would strengthen chances of further easing action. The drop in the outlook for big manufacturers came as more of a surprise to analysts, suggesting Japan Inc. doesn’t see a quick end to the gloom surrounding the first quarter. The deteriorating sentiment is likely to fuel concerns over the impact a sales tax hike scheduled for October might have on a weakened economy. A previous hike triggered an economic contraction. Plans for capital spending, a pillar of economic growth recently, came in weaker than a year ago, but a touch stronger than expected, suggesting that alarm bells aren’t ringing in company board rooms yet. If China is over the worst of its slowdown, as suggested by the latest PMI data, a recovery in exports could be on the horizon, offering encouragement to big manufacturing exporters. Large manufacturers three-month outlook registered 8, compared with analysts’ forecast of 12. Sentiment among large non-manufacturers fell to 21 from three months ago, worse than economists’ median forecast of 22. Big companies plan to increase capital spending by 1.2 percent over the next 12 months compared with a 0.7 percent forecast by economists. Large manufacturers expect the yen to be 108.87 per dollar this fiscal year.